The Poinsettia is a plant we all know and love. Although many Christmas flowers and plants are associated with the traditions of the American Christmas holiday, the Poinsettia has a somewhat surprising past. Poinsettias were known at least as far back as the Aztec times, when in the 14th to 16th centuries they used them for practical purposes. The sap was used for controlling fevers and the purple dye extracted from it was used in cosmetics. Franciscan priests began using the Poinsettia ornamentally in the 17th century as part of their nativity processions. The Poinsettia would not have gained the attention it receives today, if it wasn't for Joel Roberts Poinsett, a U.S. ambassador to Mexico. Poinsett is credited with first introducing Poinsettias to the United States in the 1820s, after spotting one growing along the Mexican roadside. At the time he maintained greenhouses on his Greenville, S.C. plantations. Poinsett sent some plants home, propagated them, and sent them to friends, and various botanical gardens. By the early 1900s they were being grown in southern California as landscape plants and for cut flowers. 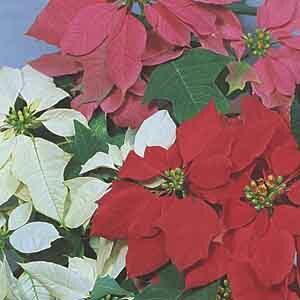 The Poinsettia then became an accepted name in English speaking countries. The native Poinsettia is straight and tree-like, and can be found naturally blooming for a short time around Christmas in Mexico. Using grower observation, careful seed selection and plant manipulation, we now enjoy the lush, full Poinsettias that we know as greenhouse grown, holiday houseplants. The Poinsettia is now considered one of the most important floricultural crops in the United States. December 12th is now celebrated as National Poinsettia Day, which marks the day of Poinsett's death to honor his discovery and love for this beautiful plant.